Even though I'm not the biggest fan of perfume, I spent a bit of time learning to create my own scents with essential oils about 6 years ago. Not only was it a great exercise in working with essential oils purely for their scent, it was quite fun. There were even a couple of blends that ended up as 'keepers'. Those 2 blends have been residing in their original (boring) brown glass drip-cap bottles ever since. Standard glass drip-cap bottles are great for storing a perfume as the blend matures, but aren't the least bit practical as applicators. My quest for the perfect applicator solution for the 'keeper scents' took a bit longer than expected. Admittedly this has not been at the top of my to-do list, so I might have been finished in a shorter span of time if I had applied myself to the job in earnest back then. Of course, it is entirely possible to put a hand-made perfume into any kind of dispenser. In my world, packaging deserves (almost) the same amount of attention as the carefully crafted, precious contents. I'm pretty sure every person in the entire perfume industry would nod their heads in agreement about how important it is to find/choose/make the right bottle for any perfume. Packaging perfume really does take careful consideration. The method of application should suit the scent. A light, airy scent may well do best dispensed from a fine mist sprayer while a more potent or heavier scent requires a more controlled application. Here, a perfume pen would suit better. My 2 blends can best be described as light-ish, yet semi-complex. One has more distinct floral notes than the other woodsy-greeny mix, but they are both the same 'application requirements' category. Putting either of them into a spray dispenser just wouldn't have worked well. A slightly more controlled application method was needed. So, when these little glass bottles with metal roll-on tops presented themselves during a recent catalog perusing, there was no doubt. They turned out to be just the ticket. 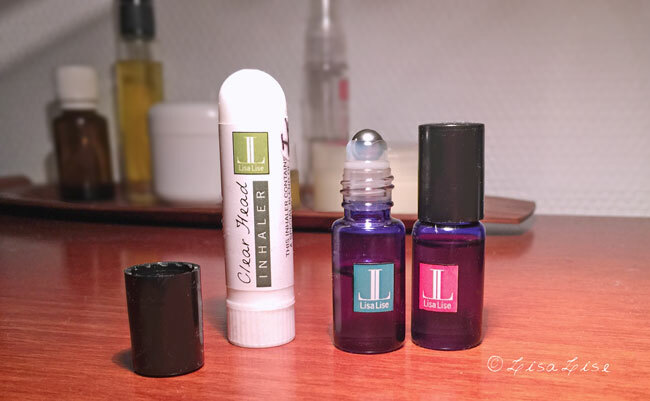 Each bottle holds a mere 5 ml (to give you an idea of the size, I placed an inhaler next to them). They allow for 100% controlled application and have been a joy to use. Roll-on applicators of this type are available in several sizes. These are from Aroma Zone (check the sidebar for links), but I'm pretty sure you can find them with anyone who sells perfume supplies. Want to make your own perfume with essential oils? Check out this post. Have you ever made your own perfume? How did you handle the packaging? I've only made perfume oils and solid perfumes, so they were easy to pack. A friend of mine offered me an oil based perfume in an amber bottle with dropper that I could take out and put on my neck and wrist. Hi Signe - Oooh I really do want to make a solid perfume at one point. Such a handy way to use perfume. We may have to add this to the do-to klist! Hi María - an oil-based perfume sounds lovely too. Have you used it a lot? Was it with essential oils? What do you think of it? I love oil based perfumes. A favorite of mine is called Krishna Musk, and another is Frankincense and Myrrh. I'm intrigued by the metal ball on your applicator; I've never seen one, only plastic ball tips. I wonder though if there's any concern with the metal and oils, essential or otherwise, reacting negatively. Hi Jenn - thanks for your kind words! It's funny you mention the metal balls - I chose these specifically because they have metal balls. Essential oils react with plastic and will ultimately ruin it, so I wasn't happy about using plastic with these perfumes. Hey there Jenn, I hope you have luck finding these with metal rollers! If you're in Europe, I can recommend checking out the French company Aroma Zone.